Are you in the market for a lovely California ranch estate nestled within the verdant hills of Los Olivos, preferably one outfitted with a mansion, tennis court, and zero uncomfortable associations with troubled pop star Michael Jackson? Then you are in luck! The 2,700-acre Sycamore Valley Ranch has just arrived on the market at the relative bargain price of $67 million, offering prospective buyers all the luxury, seclusion, and absolute normalcy that one would expect from an estate named that instead of Neverland Ranch. “Neverland Ranch,” of course, has a complicated history that could be off-putting to some buyers, which is why it isn’t called that, nor is there any mention of Michael Jackson in its listing. Why would there be? No, this is just plain old lovely Sycamore Valley Ranch, a place where you can relax and indulge yourself in private, far from prying eyes—though not in any sort of weird or morally questionable way. 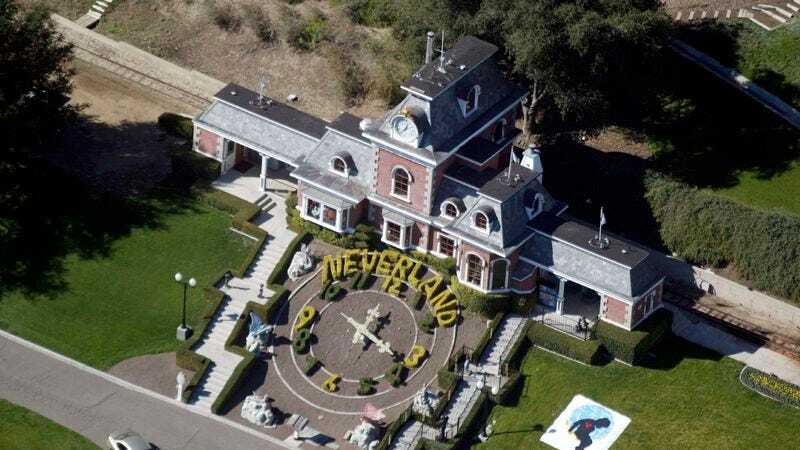 Those are characteristics one might have identified with Michael Jackson’s Neverland Ranch, a property of roughly the same size and geographical area and boasting many of the same amenities, but which failed to sell for its $100 million asking price in 2015, and soon after vanished into thin air. Some say it never really existed at all! Much like its mythical namesake, where a playful sprite who refused to grow old disappeared to romp and roll around with young boys. This property, on the other hand, was “named for the majestic sycamore trees that populate the landscape.” Regular, upstanding trees, doing nothing out of the ordinary. Feel free to take a closer look at them! You’ll find nothing that needs confiscating. While you’re wandering the grounds that may look familiar from helicopter footage—though all ranch estates look the same from up there, don’t they?—you’ll take in the 12,598 square foot French-Normandy style main house with private loft for normal sleeping, a 14-foot-deep lagoon-style pool for regular swimming, and a separate pool house with “an underground wine cellar/tasting area,” where your ordinary adult guests can sample what some might have referred to as “Jesus Juice,” perhaps long ago in another, less marketable property. You should also avail yourself of the in-house dance studio that stands cavernously empty, causing your footfalls to echo as you cross its well-trodden floors, although not in any sort of poignant way. And while you might notice the scar of recently removed railroad tracks slashing their way across the estate’s sloping hills, you definitely won’t find any trains, because this is a regular, normal house suited for normal people. Granted, there is still “a Disney-style train station,” but really, you’ll find these common to homes in these areas, just like how everyone in the ’90s just had to have track lighting and didn’t want to confront disturbing allegations against the most beloved pop star in the world. Nothing to see or think about here, besides the sweeping views of surrounding natural beauty, and lush forests that definitely do not whisper late at night with dark and terrible secrets. There’s also a giant, floral clock that says “Neverland,” but you can just ignore that.